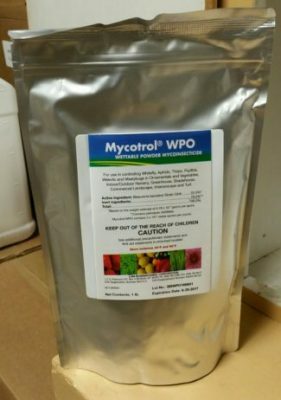 Mycotrol WPO is a formulation of a strain of the naturally occurring insect parasitic fungus Beauvaria Bassiana (see more info here and here). It is labelled for greenhouse and nursery use. It has the ability to infect most insects, and is especially effective in high humidity environments. When applied in the soil it may interrupt the life cycle of what are typically thought of as above ground insect pests, such as cucumber beetles, thrip, flea beetles, etc. Mycotrol WPO is a very effective tool against a wide variety of insect pests, especially when used in the soil as part of an integrated approach to insect management. Mycotrol ESO is the agricultural field labelled version of the same product.